Tracee Ellis Ross posed with her award following her win yesterday evening(March 30th) at the 50th NAACP Image Awards at the Dolby Theatre in Hollywood, California. Whether the dramatic pieces that Tracee wears are a hit or miss, I love how she always has fun with his fashion choices. 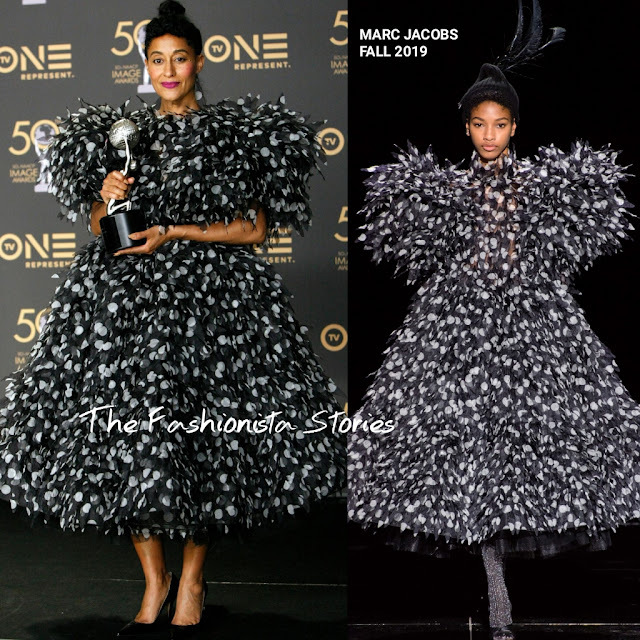 This whimsical MARC JACOBS FALL 2019 polka dot feather gown suits her personality and style. There is a lot of fabric here bit it's just enough for Tracee. Ensuring that nothing competes with her playful piece, her hair was pulled up with bangs. A touch of color came via her purple lips which topped off her winning look along with black pumps.